Winning hair isn’t everything. It’s the only thing! 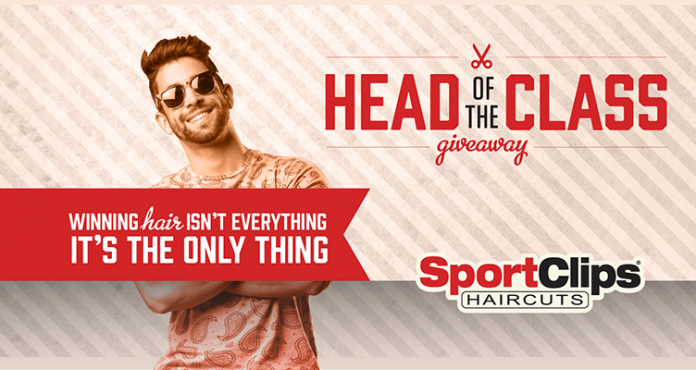 Register for the Sport Clips Head Of The Class Giveaway at www.sportclips.com/backtoschool by August 25, 2017 and you could win a $4,500 prize package of back to school gear, complete with a years’ worth of free haircuts. From a Motorized Skateboard and Fitbit Blaze to an Apple MacBook and Apple iPad Mini, you’ll get everything to start the new school year in style. Eligibility: The Sport Clips HEAD OF THE CLASS Sweepstakes is open only to individuals who are living within, and are legal residents of, the 50 United States and the District of Columbia, and who are at least 18 years of age as of the date of participation. Timing: The Giveaway begins at 8:00 A.M. (EDT) on August 7, 2017, and ends at 5:00 P.M. (EDT) on August 25, 2017. Limit: There is a limit of one entry per person/email address, per day. Random Drawing: On or about August 31, 2017, an independent judging organization will select the potential winner in a random drawing from among all eligible Sweepstakes entries received. The potential winner will be notified by mail, overnight courier, email and/or phone at the postal address/email address/phone number provided with entry. Grand Prize: One (1) Motorized skateboard, One (1) MacBook 512 GB Laptop Computer; one (1) iPad mini 4 128BG; one (1) Fitbit Blaze; one (1) Herschel Supply Co. Little America Backpack; one (1) Free Haircuts for a year ($250 prepaid card from Sport Clips); one (1) Product Gift Package as selected by Sponsor. CLASS” Sweepstakes Winners, PO Box 3000, Georgetown, TX 78627. Requests must be received by October 27, 2017. Sponsor: Sport Clips, Inc., 110 Briarwood Drive, Georgetown, TX 78628.